Swagbucks is making Halloween more than just fun & games, they're making it even more REWARDING for you! Join the Trick or Treat Team Challenge to get your next gift card even sooner! They've changed up the Team Challenge and are giving out more points, so see below for how it works. Ready to just jump in and get started? Sign up here and then join the Team Challenge. You'll be assigned a team and can start earning & contributing points right away! Swagbucks Extension: Download the Extension for Firefox or Chrome and receive 1 Swag Buck every day, just for opening your browser AND also contribute 25 points to your team every day! Tasks: Every time you earn Swag Bucks you’ll contribute 15 points to your team! SBTV Mobile (US only): Download the SBTV mobile app and you can earn up to 36 Swag Bucks a day for watching videos on your phone. You’ll also contribute 10 points to your team every time you earn. Special Offers: Whether you download the Swagbucks Mobile App to do special offers (US only) or find special offers via the desktop (International members), you’ll also contribute 10 points every time you earn! Search: Every time you earn Swag Bucks you’ll contribute 4 points to your team. Surveys: Give your opinion, get SB & and contribute 4 points to your team. Swag Codes: Redeem Swag Codes on the desktop, through the extension or on your mobile device and not only will you increase your Swag Bucks, you’ll also contribute 1 point to your team. Instagram: Upload a picture on Instagram and in the caption put @swagbucksofficial, the hashtag of your team name (#TheChocoholics, #TheGooeyChewies, #TheSourPowers) and #TrickorTreat. EVERYDAY: the team that has the most hashtags for that day will receive 15,000 points, the team with the second most hashtags will receive 10,000 points and the team with the third most will receive 5,000 points. And finally, the Top 5 point contributors on each team will win bonus Swag Bucks as well: 500, 400, 300, 200 and 100 respectively. Note that all bonuses will be awarded by November 7th, 2014. Now's the time to join Swagbucks and get even more SB towards your first gift card. 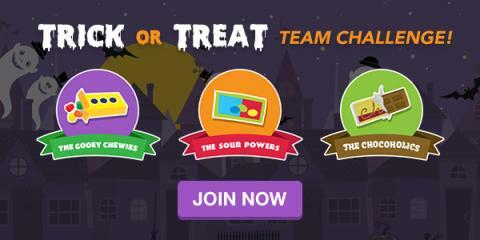 Take advantage of the Trick or Treat Team Challenge and sign up today.